We inherited a patch of horseradish, six feet by five feet. It had not been touched for several years and was rapidly taking over this patch of land. We decided to harvest it all and transplant some to a more desirable area. Horseradish is a very hardy and invasive perennial. You should use care when planting. Container planting is effective in controlling its growth, use large, deep containers to ensure you get nice sized roots. Digging up and transplanting each year also helps you control its growth. To transplant, simply select healthy pieces that don’t have soft spots or signs of decay and cut the root at an angle like this. Dig a hole and plant. If the top is starting to develop leave it. If you are doing your transplants a little earlier than we got to it or are using pieces that do not have this growth cut to top straight across and the root at an angle so that you can tell which end goes down. Horseradish can be grown as a perennial in zones 3-9 and can be grown as an annual elsewhere. It is listed as a good companion plant for potatoes, so this year we will stick some potatoes in the ground in the area that the horseradish is growing to see how effective it is at warding of the dreaded potato bug. The best time to harvest horseradish is in early spring or in the winter after the first frost. They say that a frost will enhance the flavor. You can also leave it in the ground and harvest it as you need it through the summer. In order to harvest the horseradish roots, we worked as a team. I used a shovel to dig under obvious roots. I’d pry up great big bunches, and then Charlotte would pull them out of the dirt carefully, removing as much root as possible. The root system spreads by developing dozens of little runners, so even the smallest piece of root left behind can yield new plants. To control it you need to get all of the root systems. It all came out easily because the ground was very wet. Some we plucked out by hand. Soaking the ground prior to harvest is effective in making this task easier and more successful. It all went into a pile. The pile was hosed down, and then individual roots were hosed down and transferred to 5 gallon buckets. The harvest took a couple of hours and when we were done, we had three five gallon pails full of horseradish. Some of the older roots will be discarded. You will be able to quickly tell which roots feel old and woody and which are nice and fresh just by feeling them. A whole lot of horseradish. More than we can use. The root may be stored in a number of ways. It can be buried in moist sand or put in ventilated plastic bags, in the fridge. These will allow you to keep it for up to three months. 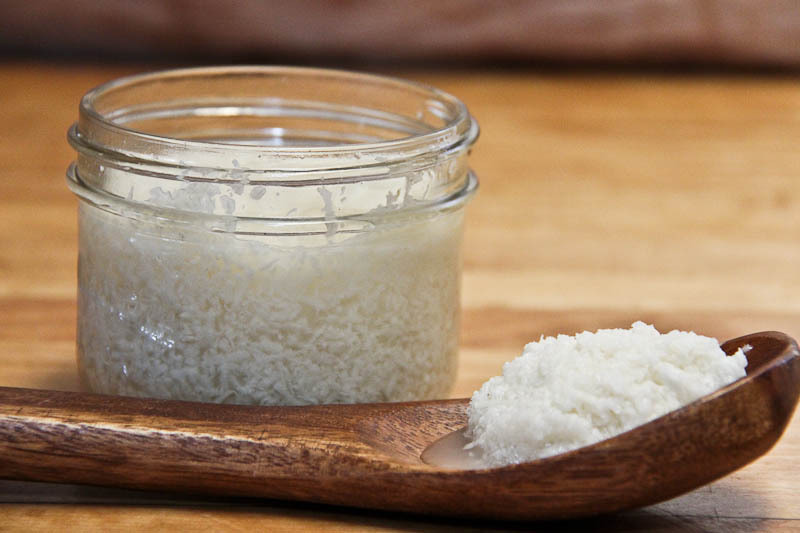 Beyond this, freezing grated horseradish is the way to go (although you may lose some potency.) Freeze in small portions. Both the leaves and the roots (tubers) can be eaten. The leave are spicy so chopping and mixing them into a salad or sauteing with mixed greens as a side dish work well. You can also dice some leaves up and add it to your favorite salad dressing to give it a little more kick. Both the root and leaves of horseradish contain magnesium, potassium, vitamin c and calcium. We decided to make several jars of horseradish sauce. Grate the horseradish. This was, by far, the most time consuming, annoying part of the process. It took about two hours of fairly concentrated grating. I used a hand grater intended for cheese. I used a fairly small grind, but not the smallest. The freshly grated horseradish is quite a beautiful product. It’s got a fluffy, light texture, betraying its potency. I grated enough to fill eight 250ml wide mouth mason jars, lightly packed, leaving a little space at the top. Close the jars and put them in the refrigerator. This will keep for a few months. Horseradish root is really simple to grow, harvest and process. The grated/brined product you end up with is quite wonderful, a classic accompaniment to many traditional dishes, a classy condiment and an easy way to elevate a mundane Caesar cocktail. One little known technique is to mix grated beets with grated horseradish for a slightly sweeter, less potent version of the traditional horseradish sauce. This works particularly well with overly strong horseradish. Horseradish root can also be used as a classic, earthy fashion accessory. It can be worn as a pendant, or small roots can be hung from the ears, or woven into the hair. In ancient times, one could buy a good quality wife for her weight in horseradish root. Horseradish is a great way to wake up a deep sleeper. Simply pour a jar of horseradish on their head. Before the invention of the glove, horseradishes were used to initiate duels. Many a famous duel was started with the ominous slap of horseradish on cheek.